Growing Russia-China ties: Does India need to worry? New Delhi can rest assured that any existing bilateral differences actually fall pale in comparison to common stakes all the three countries have in the evolution of a multi-polar global order. The recent developments in the relations between Russia, India and China may puzzle a casual observer of regional politics, but a keen analysis throws light as to how relations, whether bilateral and multilateral, in the evolving world order cannot be viewed through fragments but through a wider perspective. There has been a substantial increase in cooperation between Russia and China in various sectors. Both countries are now jointly conducting one of the biggest naval exercises and next month they will be conducting exercises on Urals Mountains to counter terrorism. 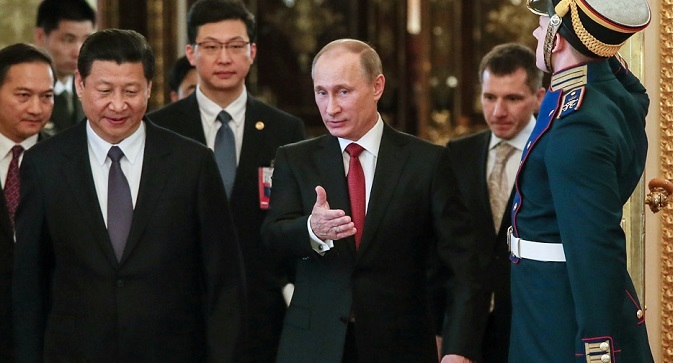 China has also signed a massive deal with Russia to procure arms and ammunition. India-Russia relations have also witnessed growth in recent months. Whether it is cooperation in the field of nuclear energy or space exploration, or arms and armaments (including the aircraft carrier Vikramaditya), or collaboration in the field of cyber security, the relations have witnessed growth despite hitches. During his visit to Vladivostok early this month to attend meeting on cyber security, India’s national security advisor met his Russian counterpart and deliberated on the theme of post-2014 Afghanistan. Bilateral differences between the countries are varied, among which border disputes stand out prominently. China shares long borders with Russia as well as India. In 2004, Russia under the leadership of Vladimir Putin took a friendly gesture in settling territorial disputes including disputes over some islands on the Amur River. Both the countries have settled their border issue amicably. In case of India and China, the border differences follow topsy-turvy path which at times appear calm and at times chaotic with accusations of violation of Line of Actual Control (LAC – the official name of border), originally drawn in 1914 under the aegis of the British rulers of India. The LAC, also called MacMohan line, has been considered unjust by China. The 1962 war between the two countries and the subsequent bonhomie between China and India’s rival Pakistan have further contributed to sour relations. As a result, despite good economic relations between the two countries the reports of border skirmishes, twice in last three months, have surfaced. Bilateral differences actually fall pale in comparison to common stakes all the three countries have in the evolution of a multi-polar global order. As members of BRICS (at the centre of which stands RIC), the three countries have shown tremendous promise as to how the group can play an effective role in shaping global order. Whether it is conflict in Syria or in Afghanistan, or the issues of terrorism or religious extremism, or the reform of international bodies, the group has played significant roles and hold potentials to address contentious issues in Eurasia and beyond. Any weakening of relations between these countries will not only contribute to fragility of the triangle, but also weaken the prospects of the rise of a just and fair world.